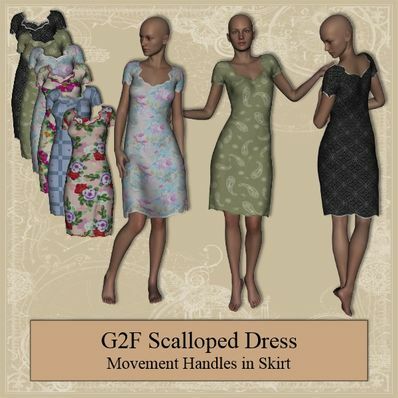 Scalloped Dress for Genesis 2 Female for use in Daz Studio 4.6. Haven't seen a dress with a scalloped collar, brilliant. Thanks for all the textures, you are always so generous. I appreciate your eye to detail and thank you for giving us soooo much! Lovely dress, gorgeous textures. Thank you! Lovely dress, just what I'm needing right at this moment, thank you. Thank you for this beautiful Dress! Looks so nice! Very nice! This can work well for retro or modern looks. As it is now Summer here in Australia, this is a very pretty dress for G2F to wear for this Season. Thanks for creating and sharing this. Spring is coming with this lovely dress! Thank you very much!